New Bank jobs in India for Jr. Officer Posts. Saraswat Bank is one of the most trusted co-operative Bank in India; having more than 281 branches all over India. This time this Bank is looking to her fresher Indian candidates for these Bank jobs in India. This is a great opportunity for them who are looking to make a career in banking line. This Bank recruitment department is going to conduct a written examination after that interview for the selection of the candidates as Jr. Officers. Below table contain the basic information about these vacancies which contain job profile, vacancies related to that job profile and the pay scale which candidate will get after the selection. What are the Eligibility Criteria for these Bank Jobs in India 2018? Applicants who have Minimum 60% marks in any Graduation stream are eligible to apply these Bank jobs in India. (Preference will be given to B.Com candidates). Candidates having age in between 21 – 27 years can apply for this Bank recruitment. Indian candidates who are looking to make a career in banking line can apply for these Bank jobs in India for officers without paying application fee. ZERO application fee for applying this Bank recruitment process 2018. 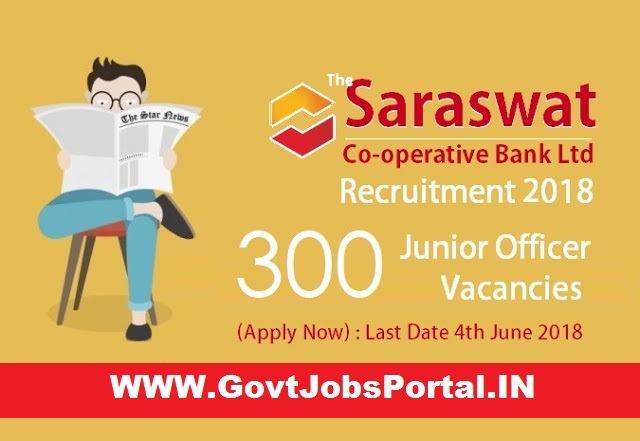 What is the Process for applying this Saraswat Bank Recruitment? The procedure for applying this Bank recruitment process is to apply online. There is no other second way for applying this recruitment process. You have to follow the official website for online application form. We also share the direct link for online application. 4th June 2018 is the Last Date to apply online.